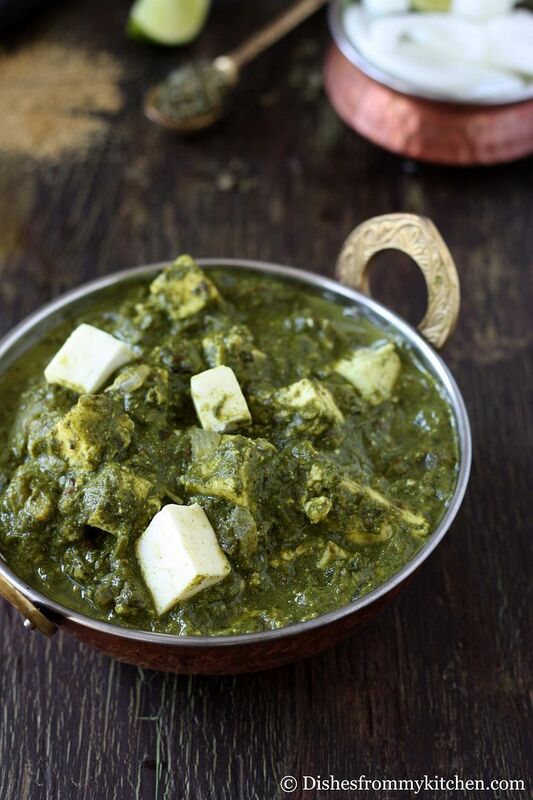 Dishesfrommykitchen: RESTAURANT STYLE PALAK PANEER - INDIAN CHEESE SIMMERED IN AROMATIC SPINACH SAUCE(VERSION II) !!! 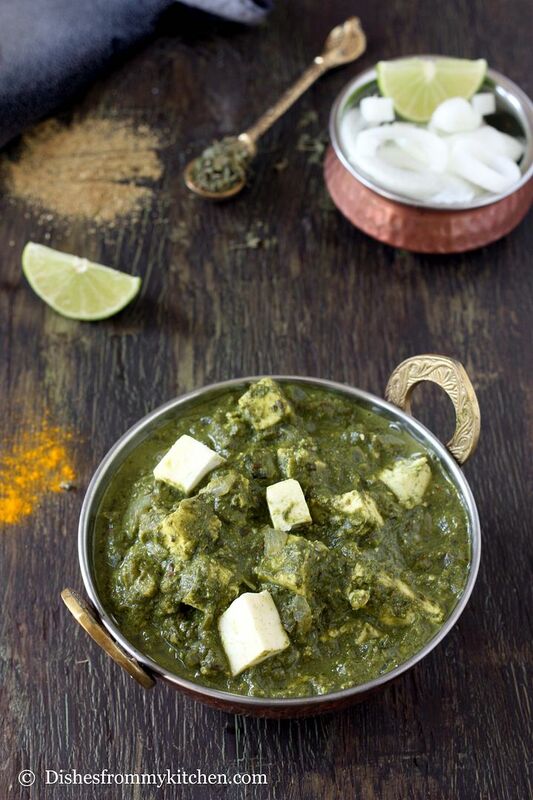 RESTAURANT STYLE PALAK PANEER - INDIAN CHEESE SIMMERED IN AROMATIC SPINACH SAUCE(VERSION II) !!! Palak paneer is a tasty restaurant dish which is famous throughout India and Pakistan. It has Palak (Spinach) and Paneer which is Indian farmer's cheese made by curdling heated milk with lemon juice, vinegar or any other food acids. This is basically thick curry sauce based on pureed spinach which is very aromatic. It is absolutely heavenly when the cheese is simmered in the sauce and served with dollop of butter. It is a popular vegetarian dish and is mainly served with any Indian breads, pilaf/pulao or plain steamed Basmati rice. It is very nutritious; I make it very often by substituting Paneer with Aloo (potato), Channa (Garbanzo), Baby corn or grilled corn kernels. I do Spinach sauce in two ways one is by adding tomato to the Curry and another is without tomato. When I am making it without tomato, to get the sour taste I add Amchoor powder (Dry Mango powder) along with lemon or lemon along with yogurt. Either way it tastes very very delicious. I have also posted the Palak Gravy with Grilled corn in which you can substitute corn with paneer to enjoy creamy and delicious Palak paneer (Version I with tomato). Since I have posted this version already, I wanted to post the Palak Paneer Version II which has no tomato. 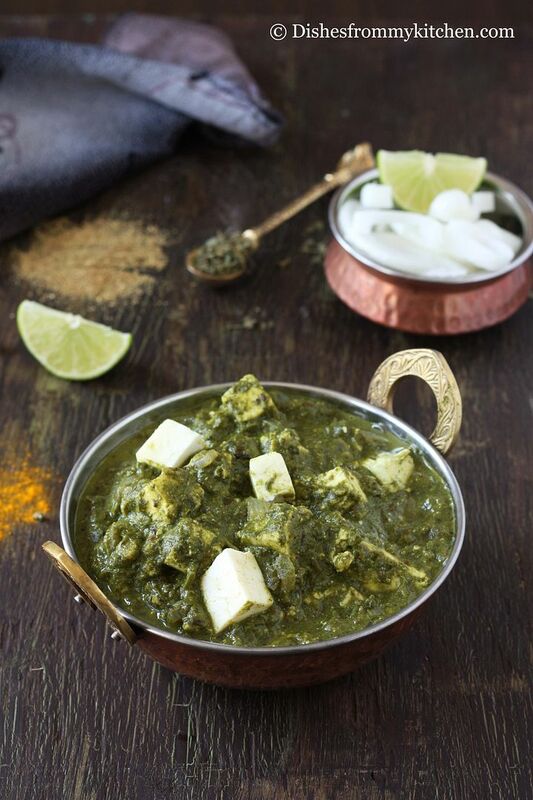 Do try both the versions and I am sure you will love Palak paneer both the ways :) Enjoy it with hot bread or rice. Read my notes if you are in the mood to substitute the cream with Yogurt and Milk :) This is a best way to eat Spinach for Kids/Adults who don’t eat or like Spinach. Enjoy the restaurant style Palak paneer at home!!!! Cut the Paneer in to cubes and put them in hot water. Let them be in hot water until you add them to the sauce/gravy. This process makes the paneer very soft and it just melts in the mouth. 1. Wash the spinach couple of times. Drain and keep it aside. 3. Make ginger and garlic paste. 4. Heat oil in the pan, add the whole cumin once. 5. After the cumin stops spluttering, add Onion and sauté till they are slight golden brown. 6. Add the ginger and garlic paste, sauté till the raw aroma disappears. 7. Now add the coriander powder, cumin powder, garam masala and turmeric powder. 8. Once they are blended well, add the Kasoori Methi by crushing in the middle of your palm. 9. Now grind the wilted spinach, coriander leaves and green chillies to into very smooth paste. 10. Now add the spinach puree to the masala mixture. Add little sugar to retain the green color of the mixture. 11. Add 1/2 to 3/4 cup of water and required salt. 13. Now remove the paneer from the hot water, gently squeeze to remove extra water and add to the spinach mixture. 14. Mix slightly until the paneer is coated well with the spinach sauce. Switch of the flame. 15. Add the butter and tsp of lemon juice. 1. 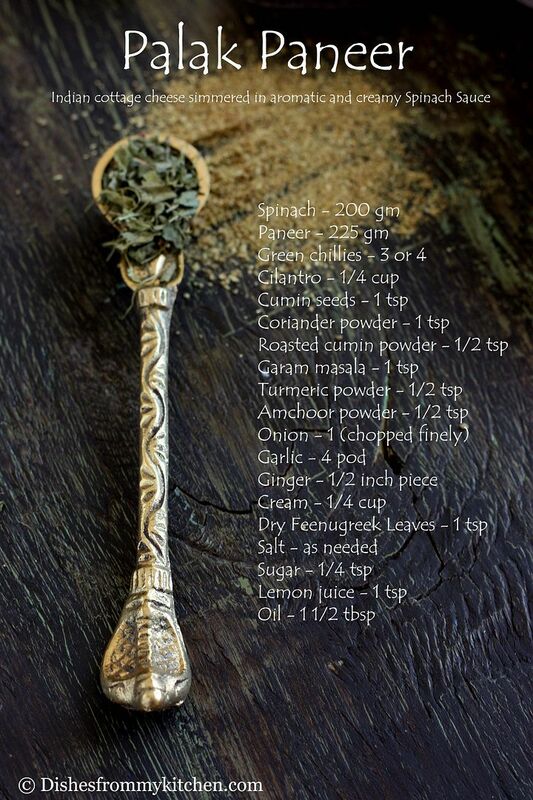 Grind the spinach puree just before adding to the masala mixture, to retain the vibrant Green color. 2. Add the amount of lemon juice according to your sourness level. 3. Add the Lemon juice after switching off the flame, to enjoy the freshness. 4. You can substitute cream with thick yogurt. If you do so, use 3 tbsp of thick yogurt and 2 tbsp of whole milk. If you are adding Yogurt follow these steps..
* Yogurt has to be added before the spinach puree is added to the masala mixture. * Mix the masala mixture and yogurt, let them blend well and come to a boil. * Now add the spinach puree and follow the other steps. * Add the milk only after you switch off the flame. * Mix everything until they are blended well. Then follow the steps from 13 to 15. 5. If you are calorie conscious you can always substitute cream with yogurt and Milk, also reduce the butter by 1/2 tbsp. 6. You can also add black salt instead of amchoor powder to get a dhaba taste palak paneer. Yay..!! I am the first one to comment..
Gorgeous Palak Paneer Pavithra! Its been a long time since I made some and you are inspiring me to do this soon. Cant stop drooling & I have just had my dinner!!! 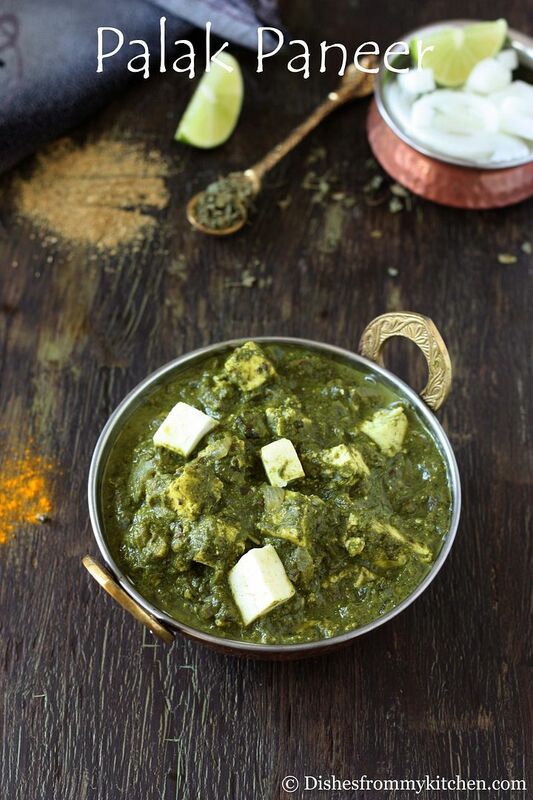 Simply delicious & creamy palak paneer..I had posted my moms version sometime back in my blog.. Both versions look very inviting.It has been a while that I made any recipe with paneer. Now you have made me want to try some. The curry looks very nice.Best for roti. Lovely dish !! Love the spoon and your pictures. 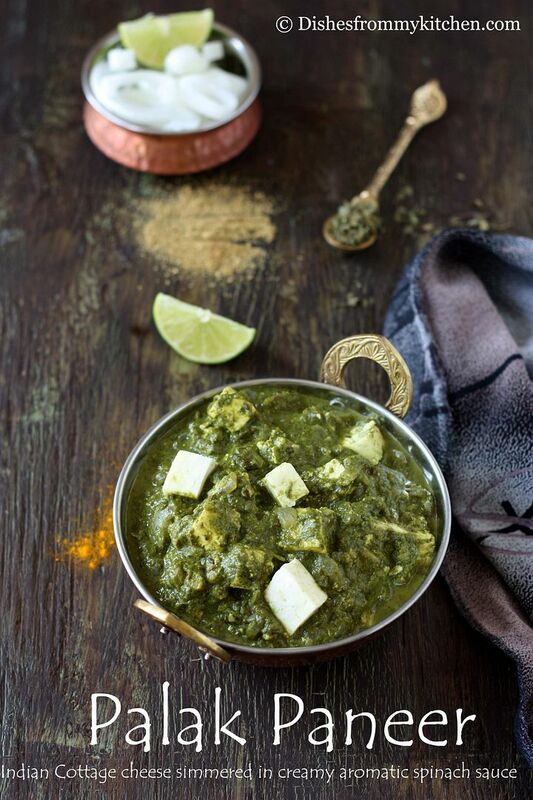 Awesome pics....palak paneer looks yumm. Delicious palak paneer and very useful notes. 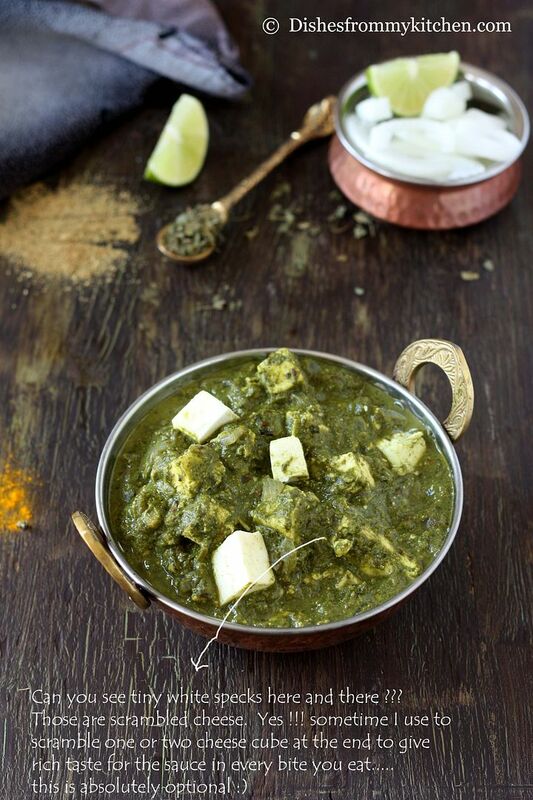 Delicious and mouthwatering palak paneer. A stuuner dish. Wish I was there when you were preparing it.Lovely recipe. Such a fantastic palak paneer,cant take my eyes from ur clicks as usual Pavi. Palak paneer is not easy to build. Additionally, it wants a whole fantastic deal of patience and time. The most straightforward & most inexpensive strategy is to acquire a wonderful prepared able to swallow palak paneer ki recipe. But usually do not hurry out and buy the shelf-stable retort package; when meals has been put in a retort oven, then it is vulnerable to raised temp and also in high temp, paneer develops an burnt/ rubbery texture. So I advocate a frozen entree as effectively and the optimal/optimally paneer entrees can be seen underneath nanak brand name new.